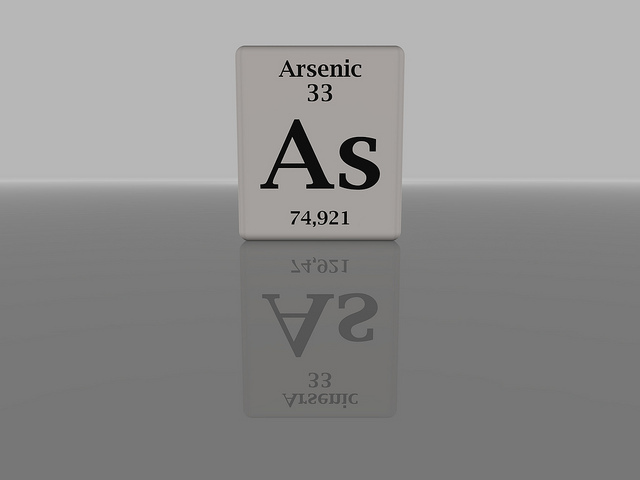 Arsenic is a natural substance that is found in plants, animals, water, soil, and rocks. It is commonly found in chemical compounds that are broken into two groups. A. Inorganic compounds- They are found in industries, building products (some pressure-treated wood), and arsenic-contaminated waters. This form has been found to be more toxic and highly linked to cancer. B. Organic compounds- They are found in some foods such as fish and shellfish. This form is less toxic and not believed to be directly linked to cancer. It is commonly used in pesticides, glass manufacturing, as a preservative in pressure-treated wood, and as an additive to lead (commonly found in lead-acid batteries) and copper. Because arsenic is a natural substance, complete avoidance to exposure is not realistic. However, there are several things you can do to limit your exposure. 1. Water – If you get your water from a natural source such as a well, get the water tested. If you use public supplied water, it is required that the water is tested and levels are kept below a certain level. You can obtain that information from your local water system. 2. Work – If you feel that you are at high risk of exposure to arsenic on the job, there are several things that can be done to reduce the risk. Make sure the ventilation is sufficient, use protective gear such as gloves, and change clothes after work. 3. Wood – If you are concerned that the wood in and around your home contains arsenic, it is recommended that you apply a sealant.